Once I am back to Singapore, I had a huge list of recipe’s to be cooked and posted. The list also included a lot of fusion recipes. 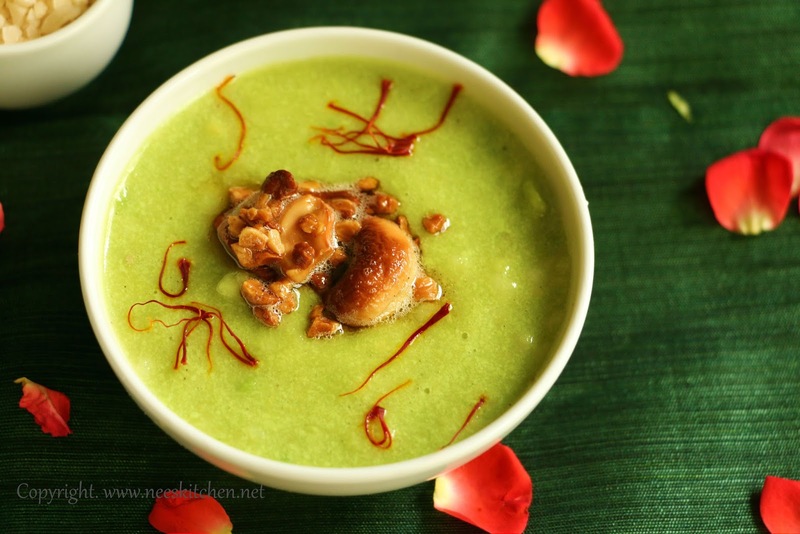 One such recipe is Avocado Ada Pradhaman . 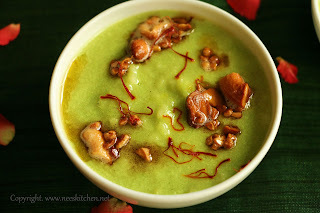 Generally I do the traditional ada pradhaman but this time I wanted to give a twist the original recipe and it became a super hit at my home. I tried twice in the last 2 weeks with and without milk. 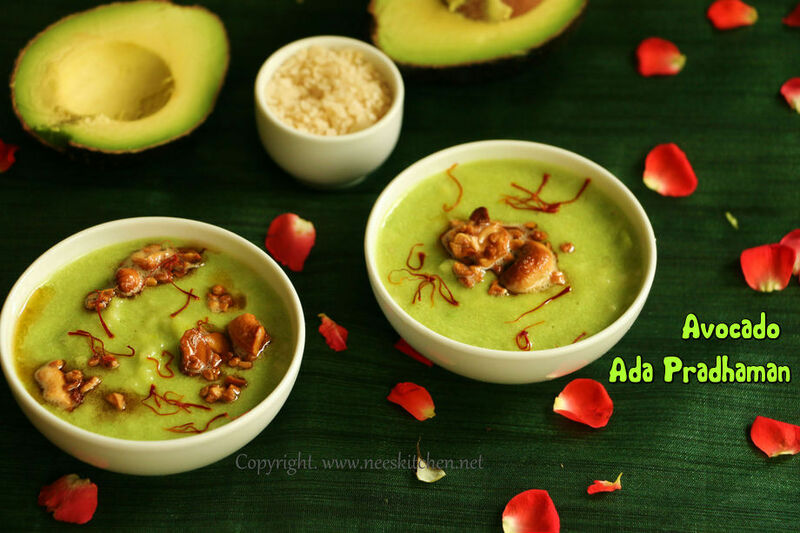 The natural creamy texture of Avocado makes the recipe so rich along with the Ada and it tasted good in both the versions. Those who are allergic to milk can have this dessert without any guilt by omitting the milk part. Avocado must be completely ripened. I generally put them for a day or two in my rice container so that it is ripened in the perfect way. You may feel free to include the nuts of your choice in this dish. 1. Wash readymade ada and drain. 2. Boil water and soak the ada for 15 minutes. Put enough water to cover the ada. A little extra is also fine. Close it with the lid. 3. Cut the avocado’s into half and twist. 5. Blend avocado, milk & saffron. 6. Transfer the pulp to a cooking pan and add water. 7. By this time the ada would have cooked in the water. 8. Mix the avocado pulp & the ada and let it start to cook in low flame. You can transfer along with the water. 9. Keep stirring else the ada would get burnt. 10. When it starts to bubble, add sugar and keep stirring at regular intervals of 1 or 2 mins. 11. When it starts to boil add cardamom, kesar milk masala. 12. Let it boil nicely for another 5 – 8 minutes. Ada would be cooked by this time. 13. Take a small frying pan and add ghee. 14. Once the ghee is melted , add cashews & almond. Let it fry. 15. Garnish on top of the avocado ada pradhaman. 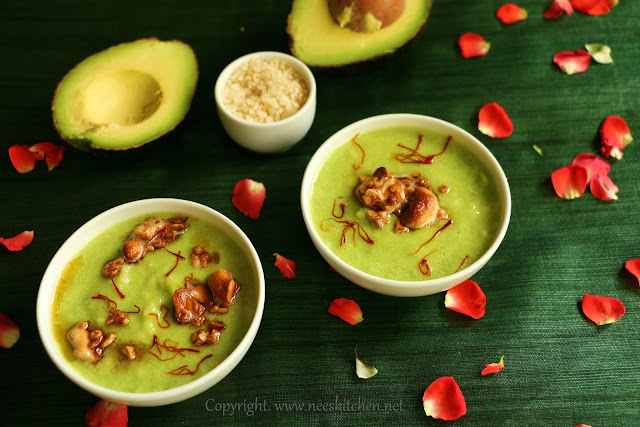 Avocado Ada Pradhaman is ready to be served. Serve it hot. The measurement of sugar is ½ cup instead of ¼ cup as seen in the sample. You may completely ignore milk and just add water instead. I have tried both the versions and both seems to be good.